Pork tenderloin is a great cut of meat that lends itself well, to being stuffed as I did in this recipe, or the tenderloin can be cut into medallions. This cut of meat is moist and tender on it’s own, not requiring any additional steps to marinade or brine it. In this recipe I used two loins with stuffing in between, which once tied together and baked makes a nice sized roast to slice. Once cooked, I served the pork with a simple mushroom sauce that can be prepared in a few minutes while the pork is cooking in the oven. This is a lovely dish for entertaining, or for a special weekend dinner. Pork tenderloin is often called “the other white meat” because it is very low fat and lean. The vitamins C, B6 and B12 found in mushrooms are responsible for boosting your immune system. This helps flush toxins out of your body that could compromise your immune system. 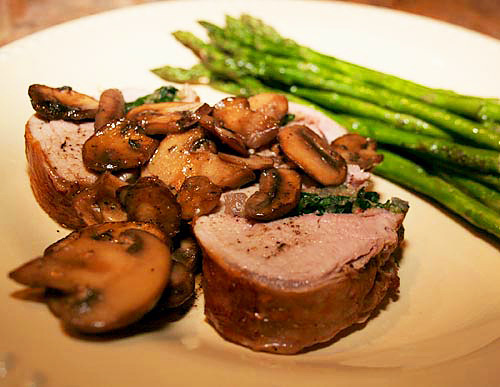 Pork tenderloin is moist and low in fat and goes well with many things, including mushrooms. Place the slices of prosciutto down one of the tenderloins overlapping them as needed to fit. Spread the spinach out over the prosciutto evenly. In a small bowl, mix together the breadcrumbs, half of the olive oil, rosemary, salt and pepper. Spread the breadcrumb mixture over the spinach, then place the second tenderloin over the first covering the stuffing and tie both together in 4 or 5 places with kitchen twine. Rub a tablespoon of the oil over the tenderloins, and season well with salt and pepper. In a heavy, ovenproof skillet heat the remaining tablespoon of oil over medium high heat and brown the tenderloin well on all sides. Place in the preheated oven and bake for about 35 minutes or until a meat thermometer registers 145 degrees F.
Transfer the meat to a platter and cover with foil, and let it rest for 10 to 15 minutes. While the pork is baking, prepare the mushroom topping. Heat the oil in a heavy skillet and add mushrooms, cook over medium heat until soft and light brown, about 6 to 7 minutes. Add the wine and broth and cook over medium high heat until thickened and reduced by 2/3. Season with salt and pepper and whisk in the butter. Cut the twine from the roast, and slice the tenderloin into 1 1/2 inch slices. Place a couple of slices on a plate and spoon some of the mushroom mixture on top.